To no one's surprise, Jamie Foxx received a best-actor Oscar nomination this week for his mesmerizing portrayal of the blind Ray Charles in "Ray." To the surprise of some, perhaps, this was good news for New Yorkers with disabilities and for the people who help them. When Hollywood turns its klieg lights on an illness, a disorder, a dysfunction, a handicap - the acceptable word is up to you - the public has a way of paying attention. On good days, that makes life easier for those who treat theproblem. On really good days, it can pry money loose from donors. "It's clear to me that people refer to movies all the time," said Dr. Harold Koplewicz, director of the New York University Child Study Center, which deals with psychiatric illnesses in children. At Lighthouse International, which helps blind and visually impaired people, officials are not counting on the Foxx nomination to bring in cash. But there are other possible rewards, said Barbara Silverstone, the president and chief executive. "Disabilities are being treated in films with much more accuracy, and not just blindness," she said. "A lot can be done to help the cause, so to speak, of raising public awareness." By now, awareness may have been raised high enough to reach the rafters. Hollywood has long cast a teary eye on diseases and disorders. "We're still reaping the benefits of 'The Miracle Worker,' " said Matt Campo, director ofdevelopment at the Helen Keller National Center for Deaf-Blind Youths and Adults in Sands Point, on Long Island. That film, about the young Helen Keller's struggles, came out in 1962. But over the last 15 years or so, disabilities have come to be cherished. For awhile, from the late 1980's on, it was all but impossible to win a best-actorOscar without playing a severely troubled character. There was the autistic Dustin Hoffman in "Rain Man," the cerebral-palsied Daniel Day-Lewis in "My Left Foot," the criminally insane Anthony Hopkinsin "The Silence of the Lambs," the blind Al Pacino in "Scent of a Woman," the AIDS-afflicted Tom Hanks in "Philadelphia," the retarded Tom Hanks in "Forrest Gump," the alcoholic Nicolas Cage in "Leaving Las Vegas," the mentally shattered Geoffrey Rush in "Shine" and the obsessive-compulsive Jack Nicholsonin "As Good as It Gets." Now we have the cinematically blind Mr. Foxx. For good measure, his competition includes Leonardo DiCaprio, who played the disturbed Howard Hughes in "The Aviator." It's almost enough to make you wonder if it is wise to go to the movies without a medical dictionary. But for those who work with disorders, the benefits from these films and Oscars are unmistakable. With "Philadelphia," Mr. Hanks made AIDS sufferers more acceptable to people unfamiliar with the disease, said Ana Oliveira, the executive director of Gay Men's Health Crisis. "They could not only see what AIDS looked like," shesaid, "they could see what that life looked like." Mr. Hanks then took on AIDS as a cause, said Robert Hagerty, who is in charge of H.I.V. research at the New York University Center for AIDS Research. "If nothing else," he said, "it makes the actor personally identify, and then usehis clout to go raise money." For Dr. Koplewicz, "As Good as It Gets" was a breakthrough. "Jack Nicholson gave O.C.D. a face," he said, referring to obsessive-compulsive disorder. "That translates into two things: destigmatizing it, and eventually permitting peopleto give money for it." THE usefulness of films in shaking the money tree is questioned by John Frank, director of development at the Association for the Advancement of Blind and Retarded, in College Point, Queens. Still, "the movies get an intellectual discussion going," Mr. Frank said. "It peels back one of the layers of the onion." Realism helps. Ms. Silverstone liked "Scent of a Woman." Lighthouse International had trained Mr. Pacino for his role. "Why shouldn't a blind person be able to tango?" she said. Indeed. At one point, though, the Pacino character zooms along New York streets behind the wheel of a Ferrari. "We cringed a little at that," Ms. Silverstone said. The concern was that some people would take that scene literally and say, "Lookat the crazy things blind people do." There is no such problem with "Ray." A blind man at a piano? Big deal. Besides, a little perspective can't hurt. "The reason Ray Charles was so great was not because he was blind," Ms. Silverstone said, "it was because he was talented." article from earlier this year on accessible pdf: adobe just announced acrobat 7.0 with "advanced accessibility features." PrWeb (USA) - Jan 11, 2005: One of the oldest country music radio stations in the country, WXRL Radio 1300AM, airs the only live talk show focusing on disabilities every Sunday from 5-6 PM EST called DisAbility News and Views, with upbeat host Monica Moshenko, making a difference for 55 million people in America with a disability, families, professionals and the community. doing their best to help people with disabilities struck by the tsunamis. from Australia to California and from Thailand to Sri Lanka. I came across the good and remarkable work done by the British-based Handicap International (HI) organisation through the Internet (http://www.handicap-international.org.uk ). HI has set up a 24-hour emergency programme to help especially Sri Lankan victims of the tsunami focusing on displaced people, individuals with temporary or permanent disabilities as well as vulnerable populations, such as children, pregnant women and elderly people. News updates continue on "Asia Tsunami 2004 - The Challenges of Disabled Survivors"
Seattle architect William Kreager uses this term to describe the tidal wave of baby boomers about to impact the housing market. The population of baby boomers will grow by 75 per cent by 2010. [I would like to take this opportunity, along with Bernie DeKoven, to recognize milestones in the history of play ... MD] Gamepuzzles (a.k.a. Kadon Enterprises) is celebrating its 25th Anniversary. That's 25 years devoted to, as they say, "the joy of thinking." In the process, their website, and their collection of beautiful puzzles and puzzle games, has grown into a treasure chest of invitations to a livelier, more playful mind. To get started playing, try the Coloring Book. I won't spoil it for you, except to say that it could very well be the easiest, and most satisfying, online coloring experience you've ever had. Next, try the "Puzzle Parlor" - it's a collection of Flash puzzles that are graphically engaging and vary in challenge from mild to egregious. If a lot of these puzzles remind you of M. C. Escher, consider yourself smugworthy. Much of the fun that is inherent in these puzzles comes from interacting with the Escher-like art of geometric transformations. It is getting to play with the playful sides of both art and mathematics.But the real treasure is their collection of almost 150 lovingly crafted, moderately-priced puzzles and puzzle-games - so lovely and enticing that you will find the time you spend virtual window shopping downright inspirational. And if you're diligent or lucky, you may even discover some of the hidden puzzles and contests sprinkled enticingly throughout the site. And, as if you actually needed the incentive, you may win a prize for solving them! Abilityinfo.com presents the International Disability News Ticker. A digest of hand-picked Disability-themed news stories from around the world. 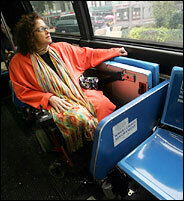 See more recent and archived news stories organized by continent at Abilityinfo.com. The site also features links, employment resources and discussion. Gizmo.com.au (TECHNET - KOREA) - Jan 19, 2005: Korea's SK Telecom has announced the launch of the 'Helper Phone', the first mobile phone developed exclusively for visually handicapped people. people as the solution to the problem of disability. disabilities by one reviewer in the disability community. opportunities to promote the movie every couple of days. the Chicago Tribune gave it 4/4 stars. appears to be his revenge on our community. The New York Times has another wonderful editorial about the insane Catch-22 our medicaid system forced on the mentally ill. Many mentally ill people do not discover their illness until they become victims of the system and commit a crime. While in prison, they may be treated, but may not be covered by medicaid during or after their imprisonment. Thus treatments stops and often they end up as repeat offenders. We need to fix a broken system and stop making mental illness a crime. Check out the entire editorial at "New York Times Editorial"
Angela Marfisi has suggested that we make plans to view the film "Rory O'Shea Was Here" when debuts at the Ritz Theaters next month. It has already received critical and audience acclaim in Great Britain, where it was released under the title "Inside I'm Dancing." Those of us who have ever been evaluated can relate to this Sunday's Doonesbury. The email below is from a professor in Sri Lanka with whom I have been in contact recently, first related to the Journal of Religion, Disability and Health, and then second, the tsunami. I asked about specific ways that people could assist disability related organizations. Others asked him the same. See his letter back to us below. You may distribute this as you wish. First of all I wish to thank you most sincerely for your generosity in offering to help persons with disabilities in Sri Lanka who were affected by the recent disaster. I give below the information as I have it at present. 1. Regarding the tragedy involving blind children from the School for the Deaf and Blind Tangalla, I finally managed to contact the school by phone and speak to the founder Mr. W. Rupasinghe Perera. There had been twenty persons in the vehicle which travelled from Tangalla to Colombo on the 26th to attend the Christmas party which had been organized for them. All the 16 children were blind, and were accompanied by one teacher, two assistants and the daughter of one of the assistants, all sighted. Twelve blind children, one teacher, and one assistant died. Four blind children escaped and helped the other assistant and her daughter to get out of the danger. The school plans to set up a fund to assist the surviving children and the families of those who died, these being mostly very poor. I would suggest, however, that, rather than sending contributions directly to the school, they should be sent to the Sri Lanka Council for the Blind, which is the principal service organization for the blind in the country, stating clearly that they be sent to the school for the fund. Please contact the Hon. Secretary, Mr. S.L. Hettiarachchy, Sri Lanka Council for the Blind, 74 Church Street, Union Place, Colombo 2, Sri Lanka; tel. 0094 112 329564, email: . He will report to you on how the funds were utilised. 2. There are isolated reports of various blind and other disabled persons being affected, and the Council plans to help them within the following financial terms, i.e. per individual.Rebuilding home: $500.00 each.Wheelchair: $125.00 each.crutches/elbow-crutches: $25.00 each. Once again, please contact Mr. Hettiarachchy from whom I got the information. 3. In Galle, in the south of the country, there is a private home for children with physical and mental handicaps. It is called Sambodhi. I hear that 50% of the building and the children were washed away. Unfortunately, I do not have any details or the contact information, but the Council for the Blind should be able to help. 4. Although initially there were requests for food, linen and medicine, I believe these are adequately covered by the existing government and other relief operations. On behalf of the persons with disabilities I thank you once again. Increasingly we find tensions being expressed between the political messages and motivations of adults with disabilities, and the parents of children with disabilities. These differences can be seen particularly starkly between Deaf adults and the parents of children with hearing impairment; and between adult advocates with autism and the parents of children with autistic symtoms and diagnoses. A particularly heated discussion has been generated by the recent New York Times article entitled "How About Not 'Curing' Us, Some Autistics Are Pleading" [December 20, 2004]. Is there anything that you believe the world tourism community should be doing in the medium term (12 months) to respond to future disasters. Here is the answer I submitted. Thank you for the opportunity to respond on the topic of post-tsunami relief and development. My contribution is regarding the long-term response. The aspect of response that I am qualified to speak to requires action at the macro level of policy and planning even at this early stage. It arises from the concept "Universal Design" and can be summarized in the phrase "inclusive [destination] development." The objective is to do what we can to see that good design - design that does not exclude - becomes the new tradition of the rebuilt Indian Ocean basin. As someone paralyzed at age 17 and now with more than 32 years traveling via wheelchair, I have tried to alert others to where we are all destined to go through the natural processes of aging - toward diminishment of our capacities long before the completion of our goals or extinction of our desires. For decades those of us in my situation (i.e. an early-analogue-to-aging) have used the language of civil rights to insert ourselves into the marketplace - and fought hard to throw off the burden of other's pity so that we could participate freely once we were there. Recently, we have been even more articulate in making the business case for inclusion. Many in the industry now understand the economic implications in the market of travelers with disabilities, of the aging populations in tourism destinations such as India, and of tourist exporters such as the US and Japan. I have been active in bringing seminal works on the topic to the attention of the industry. These are works such as Simon Darcy's travel behavior study "From Anxiety to Access" and Eric Lipp's study of the market value of US travelers with disabilities. Recently, the opportunities to speak have been numerous as awareness mushrooms: Australia's first national conference on travel and disability by NICAN in Perth, September 2004; Brazil's first national conference on travel and disability by Instituto Pestallozzi, in Canela, November 2004, Adaptive Design's first international mini-congress on Universal Design and the Travel Industry in Rio de Janeiro, December, 2004 and Shizuoka University's Universal Design Conference, later in December, 2004. Recently I spoke with the senior staff of the World Institute on Disability in a strategy discussion on the growth of the travel and hospitality industry's interest in our community. That organization is central in development of the universal design and accessibility criteria used in the rebuilding of Afghanistan and Iraq. We see a parallel opportunity in the tsunami-stricken region for culturally appropriate development and dissemination of, education around, and technical assistance on implementing the principles of universal design. We have seen numerous examples where even the existence of a few model developments using universal design have spurring innovative voluntary adoption as well as the facilitation of the social participation of all - regardless of differences in capacity brought on by birth, aging, or trauma such as will be the case with some survivors of the tsunami. I would like to propose the inclusion of this perspective in the governmental, NGO, and industry conversations around long-term redevelopment and capacitization in the region. In that regard I would consider it an honor to contribute as would my colleagues. The restructuring of the world university system continues apace. Public sector reforms, commoditisation, and expanding student numbers are all redefining higher education. What impact are these changes having on learning, teaching and academic practice, and how are students and academics responding? Sociology, Anthropology, Politics (C-SAP) invites contributions from students and staff to an international conference on these new contexts for university education. Globalisation: Is the notion of ‘globalisation’ a useful shorthand for understanding the economic and political forces reshaping higher education? How are the demands for financial and academic ‘accountability’ changing the pedagogic values and cultures of universities? In what ways are these mediated by national policy contexts? Higher Education Policy: How are national policy agendas – such as those around vocationalism, widening participation and employability in the UK - reshaping teaching and the ‘student experience’ in the social sciences? At the European level, what is the impact of the Bologna process? E-learning: What are the long-term implications of e-learning for ‘borderless’ education and the student experience? Will we see the rise of the mobile ‘global’ student? How is a reliance on commercial software affecting student learning? Pedagogy and pedagogic research: As student expectations of and responsibilities for learning change, are faculty attitudes shifting too? Will disciplinary identities and pedagogies become less significant? Can pedagogic research document these changes? Activism: What place is there for activism within universities? Can faculty and students work to challenge prevailing status hierarchies, whether within a global ‘knowledge economy’ or their own institutions? What role do scholarly and teaching linkages between universities have in mitigating the growing stratification of the social sciences in the global ‘North’ and ‘South’? Keynote speakers include Michael Apple, Robert Burgess, Chacha Nyaigotti-Chacha and Peter McLaren. Proposals for papers, panels, posters and ‘hands-on’ workshops addressing these and related themes are warmly welcomed. Papers outside the above theme will be considered for inclusion in an Open Stream. Send 300-word abstracts to Frances.Thompson@c-sap.ham.ac.uk by Friday 25th February 2005. Transported: ''This is all new,'' the writer says of her riding experience, ''and we are all making up the rules and social protocols as we go.'' (Photo by Ruth Fremson/The New York Times). Read Simi Linton's essay here. WESTMINSTER, Md. -- When a Carroll County, Md., high school had an emergency evacuation, everyone got out except for two students who were confined to wheelchairs. They were abandoned in the stairwell on the second floor. WBAL-TV in Baltimore said there is a policy at Westminster High School for what to do with the two students in wheelchairs in case of a fire. The policy said because their classrooms are on the second floor, teachers are to lead them to the second-floor stairwell and leave them there and wait for the fire crews to come to their rescue while everyone else evacuates. Jeremy Freeze, 16, has cerebral palsy. His parents, Cassie and Tom, said what happened to their son at Westminster High recently could have killed him. "There was a fire at Westminster High School just prior to the Christmas break, and I was alerted to the fact that Jeremy was left in the stairwell as the other children were evacuated," Cassie said. "If children are to be evacuated from that school, I want our children evacuated with them," Tom said. Jeremy wasn't alone waiting in the school stairwell as it filled with smoke. Robin Miller's son Brian, the only other child in the school with a wheelchair, was with him. "I got a call from a teacher the day there was a fire and they said (Brian) was hysterical because all the other children were evacuated, he was left in a stairwell with Jeremy," Robin said. Robin, Cassie and Tom all said they think the common sense solution is move their kids' classes to the first floor. They said they were told the second floor is best because it's closer to the lunchroom and therefore more convenient. "He won't be late for lunch, but he'll burn if there's a fire," Robin said. "I met with Dr. Ecker, the superintendent," Tom said. "The principal brought him down at 4 p.m. to meet with me and he assured me we would hear something tomorrow." "You can't just pick these kids and say lets leave them behind and come back and get them just because they're hard to get out," Robin said. "There has to be a better plan." WBAL-TV contacted the superintendent of the Carroll County school system several times on Tuesday, but never got a clear answer as to how the policy could be like this or what's being done to change it. The impact of the Southeast Asia Earthquake and Tsunamia on residents and visitors with disabilities has been tremendous. As with the September 11 attacks, it has proved more difficult to follow the disability angle on this story. But now the folks at the International Disability News Ticker have created a page where we can follow the various repercussions. I, for one, hope that they will take the the time to continuously update this page. Please send them notes of support on behalf of their work on this portal.